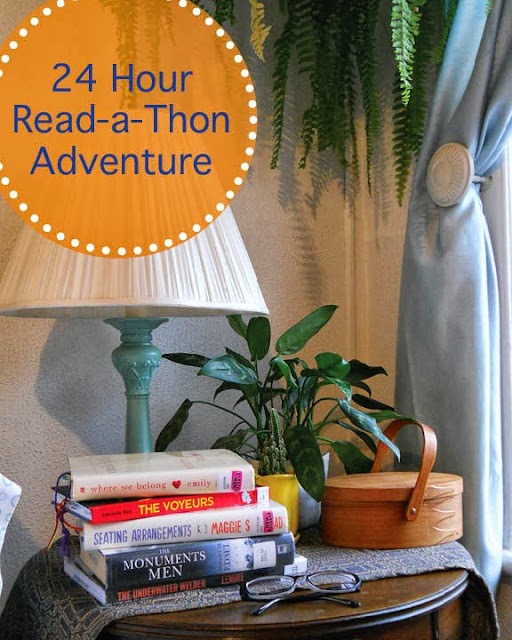 By Vee Vee: Read-a-Thon Plans! I'm taking part in Dewey's 24 hour Read-a-Thon on Saturday! I am really looking forward to this. Especially after a long week, I haven't felt well and I've experienced ups and downs at work. One full day of reading and falling into whatever story I feel like being immersed in sounds really really great right now. This week has been nothing but beautiful fall weather, bright sun, cool temperatures and chilly nights. I love pulling out the heavier blanket, scarves and sweaters. On one of these beautiful fall days I took a stroll to the library and stocked up on books I've been meaning to read, graphic novels, and a spur of the moment pick. Seating Arrangements by Maggie Shipstead - A "social satire, set on an exclusive New England island over a wedding weekend in June, provides a glimpse into the lives of the well-bred and ill-behaved." Where We Belong by Emily Griffin - This is my go-to light and easy read. I've never read the author before but she was recommended to me by a few different friends for beach-type reading. I'm not posting a synopsis because I do not know what the book is about and I do not want to know until it unfolds as I read. The Voyeurs by Gabrielle Bell - "The Voyeurs is a real-time memoir of a turbulent five years in the life of renowned cartoonist Gabrielle Bell. It collects episodes...in which she travels to Tokyo, Paris, the South of France, and all over the United States, but remains anchored by her beloved Brooklyn, where sidekick Tony provides ongoing insight, offbeat humor, and enduring friendship." The Underwater Welder by Jeff Lemire - "As an underwater welder...Jack dives deeper and deeper, he seems to pull further and further away from his young wife and their unborn son. Then one night, deep in the icy solitude of the ocean floor, something unexplainable happens. Jack has a mysterious and supernatural encounter that will change the course of his life forever." Learning about new book blogs to follow and the books other participants are reading. I always love to find good book recommendations. Eating lasagna soup, homemade bread, and salad. Hoping to finish the graphic novels, one of the fiction novels, and get at least a third of the way through The Monuments Men. I will report back. Happy Reading! I haven't heard of either of those graphic novels, but I'm always on the look for more and they both sound great. Looking forward to seeing what you think! Hope you have a great readathon! I finished Gabrielle Bell's book and I highly recommend it. She is an observant and thoughtful writer/artist and writes in diary format. Love it! OMG you have a couple of thick books on your pile. You must be a fast reader! P.s please turn off your comment captcha. It makes it easier for us cheerleaders to cheer you on! Ha! I don't plan on finishing those thick ones. I'll just be happy to dig into them a bit today.